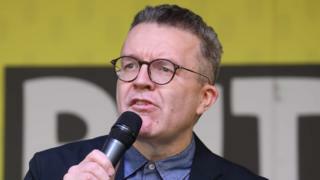 Image caption Labour's Tom Watson said about 80% of Labour MPs backed a so-called "confirmatory ballot"
A public vote on any Brexit deal could "solve the national crisis" in the UK, Labour's deputy leader has said. Tom Watson said he was a "reluctant convert" to a confirmatory ballot but if MPs "failed" to do their job, the public could make the final call. Talks between Labour and the Tories on finding a way forward on Brexit are entering their third day. He suggested Labour MPs would find it "a bit difficult" to accept any outcome which excluded a referendum option. He also revealed that Labour has opened nominations for European elections to make sure the party was prepared if the polls do go ahead on 23 May. Theresa May announced earlier this week that she wanted to hold discussions with Jeremy Corbyn in order to find a proposal to put to MPs ahead of an emergency EU summit on 10 April. On a visit to Wales to celebrate Labour's victory in the Newport West by-election, Mr Corbyn said the issue of another referendum was still "in the mix", but Parliament had twice discussed and rejected the idea. Will cross-party Brexit talks go anywhere? If a proposal is passed, and agreed by the EU, it would stop the UK leaving the bloc on the 12 April with no deal. Mrs May has now written to European council President Donald Tusk to ask for an extension until 30 June - but said she still hopes to leave before 23 May so the UK does not have to take part in European elections taking place that month. Labour agreed a policy at its last conference that if Parliament voted down the government's deal or talks end in no deal, there should be a general election. But if they cannot force one - Labour's attempt to call a no confidence vote in January failed - then the party "must support all options remaining on the table, including campaigning for a public vote". There is opposition to another referendum within Labour, with nine shadow cabinet members believed to remain sceptical and 25 Labour backbenchers writing to Mr Corbyn on Thursday, urging him to rule it out. They wrote: "Delaying for many months in the hope of a second referendum will simply divide the country further and add uncertainty for business. "A second referendum would be exploited by the far right, damage the trust of many core Labour voters and reduce our chances of winning a general election." And it has emerged that party chairman Ian Lavery offered to quit the shadow cabinet, after twice defying orders to vote in favour of another referendum. But Mr Watson said about 80% of Labour MPs backed a confirmatory referendum of some sort, evidence that the party was "holding it together" in difficult circumstances. He BBC Radio 4's Today that his party was going into the talks "with an open mind," but warned that if a confirmatory ballot was not part of an agreed plan, "we would have a bit of difficulty in our parliamentary party". "We have got a strong policy on it," he said. "People would say we don't like Theresa May's deal....That is why we are genuinely with open minds and good faith on both sides trying to see if we can work through a solution." "[But] it is pretty clear the people need to be part of that process and that is really a recognition of parliamentary failure. The argument has not been resolved in the chamber of the House of Commons." 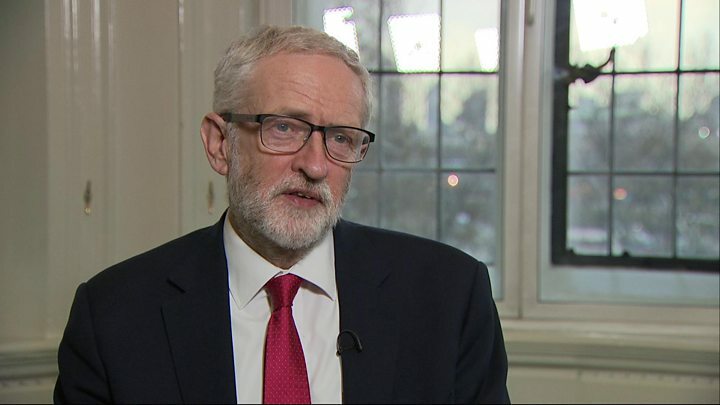 Media captionCorbyn on Brexit talks: May meeting "useful but inconclusive"
The public, he added, would be able to "work out for themselves if this deal will work for them and their families". "People can take a look at the deal and they can make a call on it." But Mr Watson did warn that the process of talks with the government would take time. "From our point of view, we [just had] day two," he said. "But we have had over 1,000 days being locked out of any discussions. "We've had all this long delay, unnecessary delay. We think these talks are happening in good faith, but it is going to take a bit of time." He added: "A lot of us hope they can find a creative solution to this issue. The first part of the talks were to establish some clarity on everyone's position. Now we are looking at quite technical detail. "We hope today [the government] can give some indication of where we can work more closely." Brexit: Will cross-party talks go anywhere?